It’s difficult to know what to make of G. V. Desani’s ludicrous autobiography, All About H. Hatterr. As a pure work of literature, the confusing employment of language has led to its comparison to Joyce, and as an author Desani has been compared to the likes of Joseph Conrad and Vladimir Nabokov for his use of English instead of a maternal tongue. Yet it is also a work of continued interest to the post-colonialist in its epitome of cultural interchange, Desani being described erroneously as a métèque author. However it is telling that the book is sporadically out of print, 1Although it is reported that the book will be reprinted next year. despite acclaim by such luminaries as Salman Rushie and Anthony Burgess, who wrote a preface to the 1969 edition of the novel. This should not be seen as a reflection of the work’s growing inaccessibility; many terms and phrases used were probably much more understandable in 1948 than they are now, but it does not suffer from the overt use of Indian words which course through many other literary works of the period. While the key motifs of the book can be interpreted as the exploration of dislocation, loneliness and the search for meaning in life, of much more interest to the colonialist are the references and allusions to relations between British and Indian, cultural, real or hidden. There are innumerable references to the English literary canon, the most obvious of which is the comical Shakespearean portage of Hatterr’s trusted friend Bannerji, presumably symptomatic of a literary heritage that does not fit the user. Bannerji represents the very finest satirical embodiment of Macaulay’s “brown Englishman”, and his frequent expounding of facts reminds us of a student of Mr. Gradgrind. Yet Desani seems to avoid any such criticism being weighed upon himself. In his preface, Burgess decried any labelling of Desani as a métèque author (derived from μέτοικος—the immigrant); he should rather be placed alongside the ranks of Conrad and Nabokov as authors with a remembrance of learning English, but who were not in the act of learning when writing—his English therefore, “gloriously impure”. Indeed Desani’s novel therefore offers a staunch alternative to the English literary tradition that had progressed through Kipling (who indeed gets a mention) to Forster in the shadow of the Great War, no better illustrated by the eloquent portrayal of the absurdities of English society and culture in English from a foreign voice. 2Desani, G. V., All About H. Hatterr, (London, 1970), p. 106. The language of the oppressor then, can not only be appropriated but can be employed so eloquently and so satirically to the detriment of the former. The novel is also riddled with the theme of illusion, deception and imitation. This is most pointedly directed at the sahib Anglo-Indian of the Club. The “wish man…must master the craft of dispelling credible illusions” teaches one of the sages in Hatterr’s travels, 3Ibid., p. 41. perhaps the greatest of which is the power of the British overlord. Indeed great fun is made at the expense of the Scot from Dundee, who infers the secret of acceptance in British society—the necktie! The employment of Faust in the illustration that deception and imitation are evil things suggests some moral judgement of Macaulay’s brown Englishmen. 4Ibid., p. 200. Yet one wonders what alternative there could be to the solidification and codification of what it means to “be” British within the context of the Empire. There can be little doubt that the need to export British culture only required that it was very much more concrete in form, and there is no better example of its existence than in the bastion of etiquette witchcraft, the Club! Interestingly, Desani’s investigations into imitation lead to further insights into the very meanings of Truth 5Ibid., p. 283.—with interesting legal implications—perhaps best illustrated by the Sage of Delhi’s wise words for Hatterr “all Appearance is false. Reality is not Appearance.” 6Ibid., p. 198. And of course who can forget Desani’s thoughts on language itself as a means of communication, and with it translation—will you aa or baa? 7Ibid., p. 284. 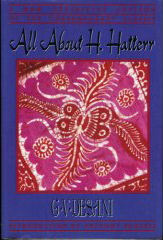 Confusing perhaps, All About H. Hatterr offers some interesting insights into the cultural ramifications of colonialism. Further, its autobiographical nature lend some insight into the character of its author, who went on to travel widely in India, investing time distilling Truth from Hinduism and Buddhism—attend! a very mad-as-a-hatter, Mr. H. Hatterr kind of thing to do. We can only hope that as a work of literature it will not be consigned to complete oblivion. And there is hope after all—it is listed in the 1001 books to read before you die meme. 1. ↑ Although it is reported that the book will be reprinted next year. 2. ↑ Desani, G. V., All About H. Hatterr, (London, 1970), p. 106. 3. ↑ Ibid., p. 41. 4. ↑ Ibid., p. 200. 5. ↑ Ibid., p. 283. 6. ↑ Ibid., p. 198. 7. ↑ Ibid., p. 284. Thanks a ton for this! You know I have my exam on Hatterr in my MA English final year! And I was looking for the summary of the text … million thanks to you!